A fireplace makeover indicates the desire to recreate your fireplace without the large project and expensive work of installing a new fireplace. The reasons you may want a fireplace makeover can vary from the simple, such as prized antlers hanging for years over the mantelpiece that you just do not want to look at anymore, to the more complicated, such as an outdated fireplace. If the latter is the case, suggestions for a makeover include improving all that frames the fire, from the bricks to the mantel; improving the area immediately near the fire, including the fireplace glass doors and screen; and improving the general area surrounding the entire fireplace. A good place to start the makeover is changing the color of the brick. Changing the color of the brick can, but does not need to, be as complicated as changing the actual bricks. Quality brick paints do the job of changing the color and look of your old bricks without tearing out your fireplace. The market’s newer fireplace brick paints are much more advanced than their older counterparts, now keeping the true texture of brick. Quality brick paint will transform darkened or previously painted bricks into bricks that make a fireplace add to the room’s spaciousness rather than darkening and weighing it down. In addition to the color of the bricks, changing the mantel will strongly affect a fireplace makeover. As with human makeovers, fireplaces often need a style makeover in addition to the fundamental makeover. Unfortunately, fireplaces lack reality shows that stop by and give your fireplace a free makeover. Fortunately, there are pictures and articles about fireplace decorating to help along the way. For the actual fire, this area is divided into two groups: those who use their fireplace and those who do not. 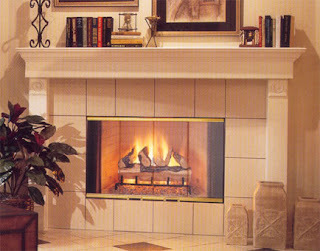 For those who do, a nice fireplace screen or quality fireplace glass door will both protect and stylize your fireplace. If you have either glass doors or a screen which just hurt the look of your fireplace, they may need to be replaced. Fireplace glass doors can darken with time, and an old screen can show signs of age and overuse. For those who do not use the fireplace, skip the screen and glass doors, and if you consider that a fireplace must have some sort of fire flickering in it, opt for candelabra. A fireplace makeover can extend farther than the confines of the fireplace itself. A small rug (preferably one from which charcoal stains can easily be cleaned!) in front of the fireplace, surrounded by chairs and a small coffee table create a comfy atmosphere. Furniture placement creates a particular mood, and can prove important in making over your fireplace. While a fireplace makeover involves a few steps, it can be an enjoyable and a rewarding task. At the end of the process, the fire you light will display your made over fireplace, highlighting its new look. A fireplace makeover can initially seem like a daunting task, but once it is undertaken, it proves to be one of home improvement’s most rewarding projects.